If your company specializes in doing construction or some other type of work that typically calls for your employees to operate at various heights, you will likely need to rent adjustable work platforms. 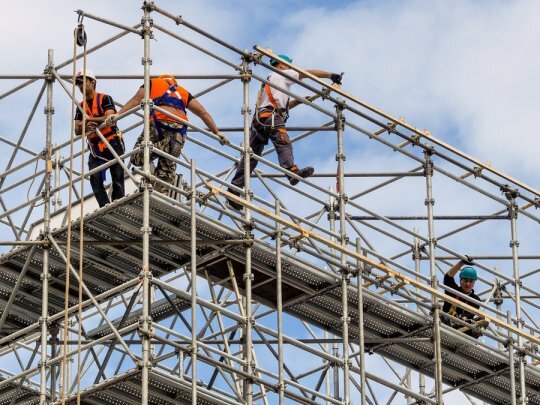 A scaffolding rental is a great way to keep your employees safe while simultaneously ensuring that you will be able to get a job done. Before selecting scaffold rentals, use these tips to choose the right one. Figure out how many of your employees will need to be on the scaffolding at one time. Will you only have one or two employees on your scaffolding rental at a time? If so, you still want to make sure that it can support them, but you probably don’t need to provide them with a gigantic platform that they won’t actually need. The size of your scaffolding rental should be just large enough to fit your employees comfortably so that they can go about their business. Determine how high you will need your employees to be while working. Are you going to be working on the second-floor of a building—or helping to restore a tall bridge? Prior to picking out a work platform , you should consider how much height you will need. A system scaffold can be set up to accommodate most heights, but you are going to want to have a clear plan in place as far as how high your employees will need to reach. Keep the safety of your employees in mind at all times. If you pick a scaffold that is too small and try to put a dozen employees on it at once, you will be putting them at risk. Likewise, if you fail to erect a sidewalk canopy over an area that sees a lot of foot traffic, you could put pedestrians at risk when they walk by your work site. Keep safety in the front of your mind. Scaffold Resource provides commercial companies with the adjustable work platforms serving Washington, D.C. You can call (301) 924-7223 to reserve the right scaffolding for your company today.